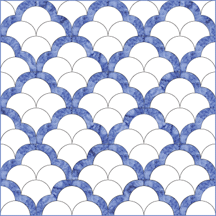 Templates for clamshell quilts to print on fabric or paper. Print hundreds of clamshell shapes on fabric (or on paper for templates) in a few minutes and start sewing! 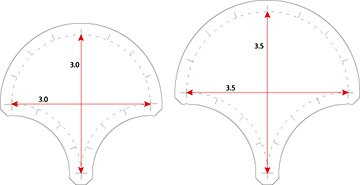 Inklingo makes Clamshell curves fun for more quilters. Even experienced quilters sometimes avoid sewing curves, but the precise stitching lines and matching marks—printed on the fabric with Inklingo—make a big difference. Why I don't sell acrylic templates. Please click the covers for details. All prices in US dollars. 1. 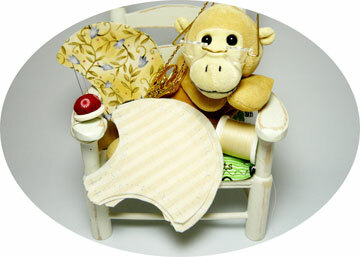 In 2010, many Inklingo quilters were interested in a Clamshell Quilt-Along. They could see that Clamshell would be much easier with Inklingo than with templates. NEW 2016 - 4 new Clamshell sizes! When Inklingo quilters ask for shapes, we listen! There are also images the Victora & Albert Museum site. Search for item number 242-1908. 3. Barbara Brackman wrote about an "Unknown Pattern" on her wonderful Material Culture blog. Who could resist? This is a rare design because it is difficult to sew without Inklingo. With Inklingo, the arcs of triangles are perfect for chain piecing by machine, or for continuous stitching* by hand. I asked Ruth Oblinski if I could use her photo. She pieced this gorgeous Clamshell Pickle with Inklingo. Her comment: "It was a joy to piece." Notice the beautiful scalloped binding! You can see Ruth's other Inklingo projects on her blog. Thank you, Ruth! Mary Althaus is an amazing quilter. She has been using Inklingo since 2006--the first day! In fact, she taught me how to hand piece in 1998 and was one of the first 3 people I told about Inklingo. I'll never forget her reaction. Needless to say, she was very encouraging! See more details on the All About Inklingo blog. You can also see several more of Mary's Inklingo quilts on the All About Inklingo blog.